Notifications: they are sent automatically to a BizDock user to notify him of an action to be performed (like a Milestone approval) or an event concerning him (like a new Initiative in his portfolio for a Portfolio Manager). Each Notification has a type and a detailed description. Message: a BizDock User can send an internal message to other user(s). With BizDock: the “Notifications menu” is present in the top navigation menu, it contains the list of last 5 Notifications and a link to display all. 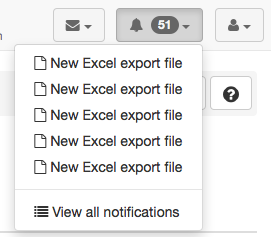 With emails: each Notification is sent to the user email, the “Notifications menu” is not displayed. The configuration of the “Notifications sending system” to use could be done in the System preferences. Each BizDock User has 2 inboxes, one for his Notifications and one for his Messages. He can directly see how many are not read yet and directly access the last 5 items. The “Notifications menu” and the Notifications list page exist only if the “Notifications sending system” is “BizDock notifications”, see the System preferences to configure it. Each Notification's link allows a quick access to the page where the BizDock User can either perform the required action or get more information about the event. A Notification is automatically marked as read when the BizDock User follows the Notification's link. The list of notifications is a filterable and sortable table. A Notification can be deleted simply by clicking on . It also possible to delete a set of notifications: simply select the wished ones by checking the left-box and then click on the “Delete” button. As for Notification, the number of unread Messages are displayed in the top menu bar. Each BizDock User can send to one or multiple other Users a Message via the “Send a message” form. Each Message can then be marked as read by clicking on or deleted by clicking on .